Microsoft Edge: It is only for the users those who all still working on the Windows 10. The Company introduced this Brand along with the Windows 10 Release. After this one year, the company celebrated its First Anniversary along with New Updates. Microsoft Edge has also updated with new features. The Windows 10 Operating System launched along with the new Branded Browser only for the Windows 10 users. This New Browser got massive response from all around the world. The company has also didn’t stop their updates for Microsoft edge. Some of Major important updates are implemented on this Windows 10 Anniversary update. The Official website of Windows mentioned some notes about the New Microsoft edge update. We shared that here in a short note. Let take a look here below. Customize your browser with Microsoft Edge extensions. Ask Cortana about any image. Better tab behavior on Mobile. Microsoft Edge introduced the extension facilities, it most recommended one for all the Computer users. At present, the most brand popular extensions such as AdBlock and Adblock Plus, Amazon, Evernote, LastPass, Microsoft Translate, Office Online, Pinterest, Pocket, etc., are available now. The Windows 10 team says that they will bring all other brand extensions to edge as soon on the later updates. Microsoft Edge is the only browser to score 100% on the HTMPL5 Accessibility. 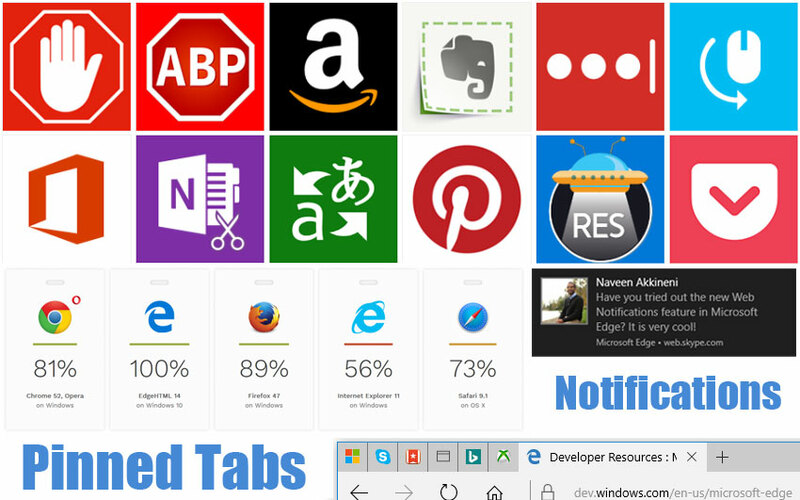 Pinned tabs: The most needed updates are fixed along with the Windows 10 Anniversary. Like a Google Chromes Bookmark, here the Microsoft Edge introduced the Pinned Tabs. Chrome has the facility to store a large number of sites into the bookmark folder. Here, we can able to pin only a few in a row. Notifications from websites: We get notification from the website that we allowed like Facebook, Skype for the web, and other websites. We can able to manage the notification with the help of settings. Swipe to navigate: It is only for the Touchscreen windows 10 PCs and Mobile. We can navigate our past history and forward. Ask Cortana about any image: Cortana can help us to find out the information about an Image and find out the related image on the Internet. Better favorites: It allows us to import our favourites from Firefox, Chrome, and other browsers. Also allow us to arrange the tabs as our wise. Better download management: Same like as the Chrome settings. This gives reminder if we close the tabs while downloading is in progress. So, we save our file by discontinued. Also, we can make the default folder to save all the downloading files. Drag and drop folders: The drag and drop facility can be made more easier way for all of us. So, here after we can change our Facebook Profile Picture by using this simple option and make it as quickly. Also, handling our OneDrive, DropBox, GoogleDrive and more. Stay tuned for More Updates about Microsoft and Windows latest Updates.